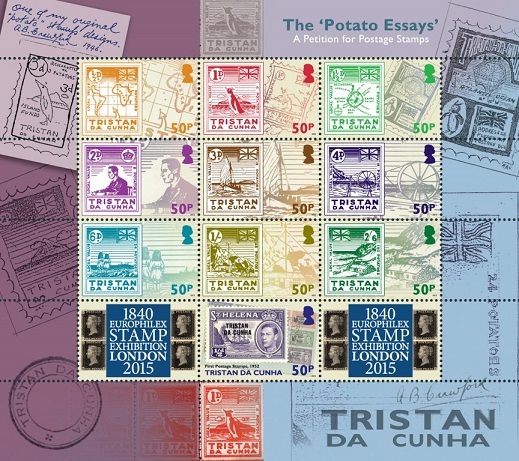 This sheetlet shows nine stamp designs, with face values in pence and potatoes, submitted by Allan Crawford with his 1946 petition to the UK Postmaster General for Tristan da Cunha to have its own postage stamps. Allan Crawford first went to Tristan da Cunha in 1937 when he joined the Norwegian Scientific Expedition whilst on a trip from Southampton to South Africa. On later visits to the island as a meteorologist he realised there was a demand for stamps from philatelists and passing ships from the so called Loneliest Inhabited Island in the world. So he decided to develop and produce a stamp or "sticker" for the islanders to place on the outside of their letters. Due to the fact he had little work to do in the peace time weather headquarters he enlisted the help of the departments draughtsman Sgt. Jimmy Brown and they worked together to produce some rough designs. As they did not have permission to use the King George head on them they used the British Union Flag. The islanders also had no money so would not be able to purchase them. They had however during WW2 used potatoes as currency with 4 potatoes equalling 1 old penny (1d) so this currency was added to the designs. They came up with 9 designs and Allan had 20,000 penny sheets made, each stamp depicted a penguin and its value was 4 potatoes printed in red in sheets of 35 stamps by Hortors Ltd of Johannesburg. The stamp/sticker soon achieved fame as a souvenir from passing ships and collectors throughout the world and was nicknamed the potato stamp. It also became a misconception that as they were called potato stamps they were produced using a cut potato like children at schools did to make patterns. 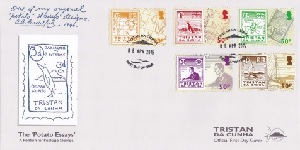 The 9 designs in black and white were used later in 1946 as part of a petition for stamps for Tristan da Cunha which was submitted to the UK Postmaster General for consideration as a legitimate postage stamp. The petition for stamps however was refused and it wasn't until 1952 that overprinted Tristan da Cunha on St Helena definitive stamps were used as the islands first postage stamps. This 2015 stamp sheetlet has been produced using Allan Crawford's black and white designs submitted as part of the petition together with Tristan's first official stamp, the overprinted St Helena definitive. The border of the 2015 sheetlet depicts some of Allan Crawford's early designs. The issue is designed to align with the 175th Anniversary of the Penny Black and launched at the Europhilex Stamp Exhibition London 2015. 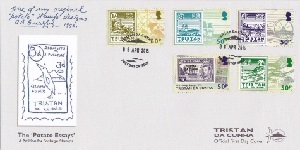 Allan Crawford went on to design many stamps for Tristan and was awarded an MBE in 2002 for services to the island.